Tamales can be traced back to as early as 7000 B.C. in Pre-Columbian history, when the Aztec women were taken along in battle as cooks for the army. There was a need to have a more portable yet sustainable food and the tamales could be made ahead of time, packed and warmed as needed. 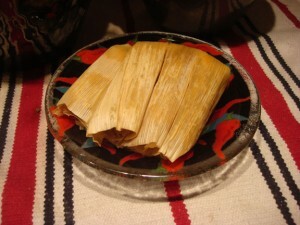 Originally, the tamales were cooked by burying them in hot ashes, which made them crispy and brown. However, as time progressed, the Aztecs began to implement new methods for cooking, learned from the Spanish conquistadores. At which point, steaming the tamales in underground pits or in uncovered pots became the practice. When steaming the tamales, the Aztecs believed that the tamal sticking to the bottom of the pot was a sign of good luck, and would protect them of the dangers on the battleground. The tamale changed in size, color, shape, and filling, depending on the location and the resources available. The wrappings varied from cornhusks, to soft tree bark, to edible leaves, such as those from avocados and bananas. Even fabric was sometimes used. Today, the most common variety is a tamal composed of masa (hominy flour dough) spread on a corn shuck and filled with either chicken, pork, beef, green chile, cheese, or, more recently, vegetables. Another thing that has changed is the use of the tamale as an every day food. Unlike in Aztec society, today’s tamale tradition is as much about making them as it is about eating them. There is nothing different about “Christmas” tamales, other than they are made for Christmas. However, because the preparation is so time and labor intensive, tamales have become associated more with the Christmas holidays and special occasions. Perhaps because these are times that family and friends come together and thus can work together to prepare the masa and to make the sauces and meats. The kitchen is converted into an assembly line to wrap the tamales before steaming them in large pots on the stove. The tamale making process takes all day and preparations often start one or two days prior. Therefore, making just a few tamales is rarely heard of. Tamale making has become a social event, often referred to as a tamalada, where people come together to make new friendships and strengthen old ones. Today, the influence of the tamale has expanded beyond the Hispanic community and is loved by all cultures. The next time you eat tamales, hopefully you will appreciate not only the time and effort that went into making them, but also the history behind it.